Please Don’t Drink From That Hose! A reader wonders if it’s safe to let her kids drink from the garden hose. In a word, probably not. (OK, two words.) Here’s the deal; most ordinary garden hoses are indeed not safe to drink from. I learned this a few years ago when trialing hoses for various qualities. I am always looking for a hose that won’t kink easily, since I rend to drag them around corners, behind big rocks, and under bushes. At the time, I ended up preferring both Flexogen and Colorite Water Works hoses. Over time, however, my Flexogen hoses have gotten softer and more prone to kink. After almost 10 years of use (and mild abuse), the Colorite Water Works hoses are still in good shape and are still less apt to kink. They remain more supple than most hoses in cold weather as well. In one informal test, I was able to demonstrate that this hose keeps on flowing even with a UPS truck parked on top of it. If this label is present, or if there is no disclaimer and no statement about drinking safety, it means that it is not a good idea to drink–or let your kids or pets drink–from that particular hose. When I first learned that, it made me determined to buy only drinking water safe hoses from then on. I wouldn’t even let my kids play in a splash pool unless the hose I used wasn’t adding a chemical bath to the bubbles. So what’s in those funky hoses? Most contain phthalates plasticizers, substances that are illegal to use in products children will use. Some also included lead in amounts exceeding federal Safe Drinking Water standards. As it happens, lead is a common stabilizer in the kind of plastic (polyvinyl chloride) used to make many types of hose. The lead can often leach from these hoses, so a quick slurp on a hot day can deliver an unsafe amount of lead to an unsuspecting child, gardener, or dog. Even small amounts of lead can lead to brain damage, significant anemia, and other health problems, especially in children. Since lead damage is irreversible, a safe hose starts to seem like a bargain. Several studies found that many ordinary hoses leach significant amounts of lead into the water passing through them. Even some safe hoses contained tiny amounts of lead in water left standing in the hose for a day or so. However, all drinking quality hoses tested lead-free after running fresh water through them for a full minute. Bottom line? Don’t let your kids drink from any hose you don’t know to be safe, and flush safe hoses well with running water before sipping or filling the pool, or the pet’s bowl…. Companies that make or carry drinking water safe hoses include Teknor Apex Boat and Camper, Swan Marine & Camper, and other boating and camping supply sources. 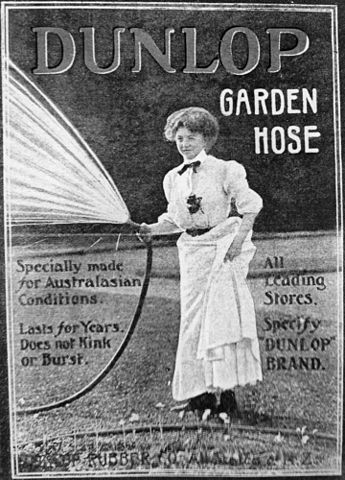 Gardener’s Supply Company carries several safe hoses (www.gardeners.com), and the Craftsman All Rubber Garden Hose is widely available at hardware stores, running about $35 for the most useful 50 foot length. However, it is important to understand that not all hoses from any company is safe to drink from: Only hoses specifically labeled as drinking quality or drinking safe are safe to drink from. This entry was posted in Garden Prep, Pets & Pests In The Garden, Soil, Sustainable Gardening, Sustainable Living and tagged Safe Hoses. Bookmark the permalink. Thank you so much for this post! It seems as if danger lurks everywhere for the unsuspecting consumer. Now I am wondering (and worrying) about the implications of having used a possibly icky hose to water my vegetable garden all of these years. Do you know the likelihood of lead and other chemicals making it into our food supply in this way? Well, the possibility is certainly there, but I suspect that the actual transfer amount is probably fairly low (or we would all be brain damaged; or wait…maybe we are???). Everything I’ve read indicates that the issue is most important for small-mass folks like kids and pets, but ultimately for us all. Heavy metals can indeed migrate into plants, but before getting too upset, I’d check your hose (you can look it up on line on one of the safety sites like http://thesweethome.com/reviews/the-best-garden-hose/ and/or http://www.healthystuff.org/findings.050312.garden.php (there are lots of other sites out there too…) Maybe yours is made of rubber, or is one of the safe ones (quite a few are these days, now that the issue has been called out).